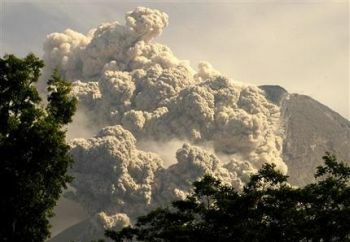 15,000 villagers living around the mount are fleeing, as the Mount Merapi is getting violent. The volcano spewed a column of gas, sending out clouds of hot ash that glided 3 1/2 miles down its slopes. The searing heat generating from the lava made some jump into rivers to escape, while others are fleeing from the nearby regions in trucks. The Indonesia’s most dangerous volcano bursted out Thursday at 9 a.m. to be the largest eruption yet, as it is happening for weeks. According to some scientists, the May 27 earthquake that killed more than 5,700 people about 25 miles south of Merapi might be responsible for the volcano’s getting volatile these days. It has been reported that 3,500 people fled to the Sleman district on Merapi’s southern side with some 12,000 leaving their villages heading for Magelang district on the west. No incident of injury has been reported yet.